INTROIT The Spirit of the Lord hath filled the whole earth, allel. ; and that which containeth all things hath knowledge of the voice, Allel., allel., allel. (Wisd. I.7.) Let God arise, and his enemies be scattered: and let them that hate him, fly before his face. (Ps. 67.) Glory etc. COLLECT God, who on this day didst instruct the hearts of the faithful by the light of the Holy Spirit: grant us in the same spirit to relish what is right, and ever to rejoice in His consolation. Thro'. — in the unity of the same, etc. GOSPEL (John XIV. 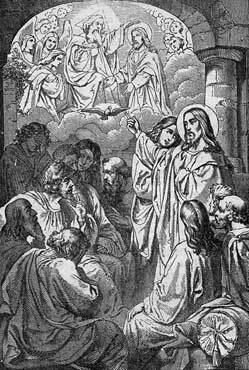 23-31,) At that time, Jesus said to his disciples: If anyone love me, he will keep my word, and my Father will love him, and we will come to him, and will make our abode with him. He that loveth me not, keepeth not my words: and the word which you have heard is not mine, but the Father's, who sent me. These things have I spoken to you, abiding with you: but the Paraclete, the Holy Ghost, whom the Father will send in my name, he will teach you all things, and bring all things to your mind, whatsoever I shall have said to you. Peace I leave with you, my peace I give unto you: not as the world giveth, do I give unto you. Let not your heart be troubled, nor let it be afraid. You have heard that I said to you, I go away, and I come unto you. If you loved me, you would indeed be glad, because I go to the Father; for the Father is greater than I. And now I have ;told you before it came to pass, that when it shall come to pass you may believe. I will not now speak many things with you; for the prince of this world cometh, and in me he hath not anything. But that the world may know that I love the Father, and as the Father hath given me commandment, so do I. As St. Paul (Gal. V.. 22-23.) enumerates them, they are twelve: 1. Charity. 2. Joy. 3. Peace. 4. Patience. 5. Benignity. 6. Goodness. 7. Longanimity. 8. Mildness. 9. Faith. 10. Modesty. 11. Continency. 12. Chastity. To obtain these fruits as well as the gifts of the Holy Ghost, we should daily say the prayer: "Come, O Holy Ghost, etc."